Norwegian Joy which has been purpose built for the Chinese cruise market is one step closer to its new home. The newest ship for Norwegian Cruise Line has successfully completed its 14-hour long conveyance on the Ems River which began in Papenburg, Germany. The Breakaway-Plus class vessel departed the Meyer Weft shipyard on Sunday, March 26 for the very first time. The vessel made its conveyance along the Ems River which is a slow and precise process. Norwegian Joy made its way along the river in reverse and was helped by tug boats and pilots. It all started at 9:00 PM when the large ship went through the shipyards locks with just 1.2 meters to spare. After 14 hours the ship arrived in Eemshaven, Netherlands on Monday evening, March 27. From there crew members will begin to arrive to get ready for guests in April. 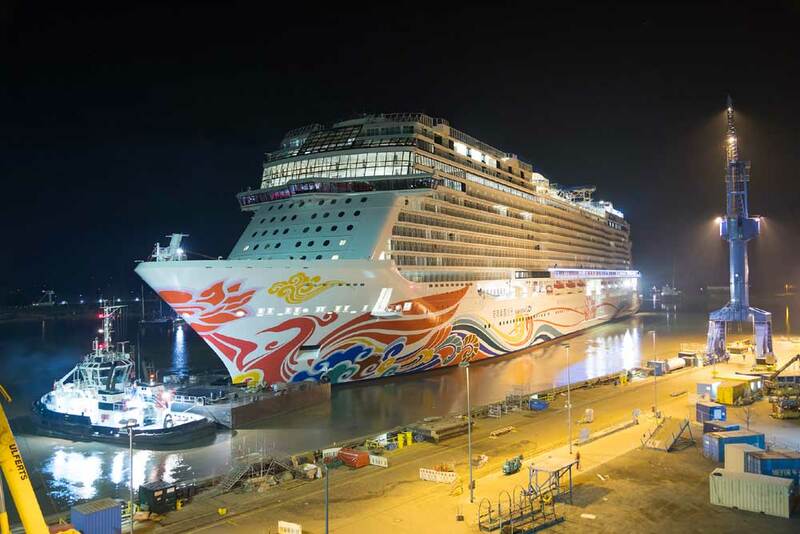 Following her delivery on April 27, Norwegian Joy sets sail for China, where she will be showcased through a grand inaugural port tour. The ship will be based out of Shanghai and Tianjin and the christening ceremony will take place on June 27, led by her Godfather, ‘King of Chinese Pop’, Wang Leehom. Norwegian Joy is 168,800 gross tons and measuring 1,094 feet long and 136 feet wide. The ship can carry 3,850 guests.